Seems strange, right? No sukkah this year. Let me explain. My parents are aging and their health is none too good. My wife and I haven’t been able to visit them in a while. A window opened up in our schedules, so we took a long weekend and drove down to their place in Southwestern Utah last Friday. We stayed Saturday and drove back home Sunday. As most of you reading this probably know, Sukkot began at Sundown last Sunday. Now we got home at about 2:30 p.m., but I was all in from a nine-hour drive so I didn’t haul out our little sukkah kit and put it together as I usually do. However, yesterday morning, the missus and I were up at the same time along with our son David, and I asked her if she’d like me to assemble the sukkah when I got home from work. Her answer kind of surprised me. She said that I built the sukkah each year because I wanted to, not because she wanted me to. I distinctly remember one year her thanking me for remembering to put up the sukkah when she forgot. We never have meals in it and it’s rather small, maybe fitting two or three people max. In our marriage, she’s the Jewish spouse and I’m the goy. I suppose I could have built it anyway, but something told me that if she didn’t want to observe the mitzvah as a Jew, who am I to do so (and not being Jewish, I can’t really observe the mitzvah anyway)? I know some of you are going to say there is an application for Gentiles in Sukkot and I agree with you. On the other hand, without the Jewish people, without the Exodus, without the forty years in the desert, there would be no celebration of Sukkot, and none of that has to do with we goyim, even if we are disciples of Rav Yeshua. 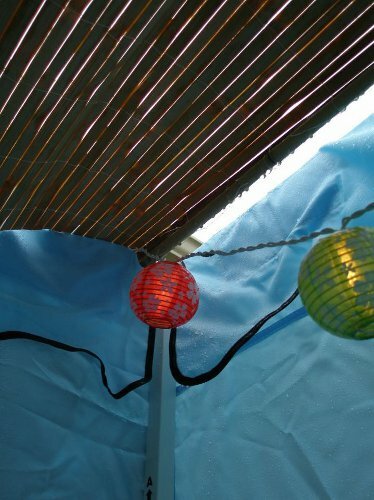 So this year, it’s Sukkot, but without a sukkah. Perhaps it is fitting since I have distanced myself from at least certain elements of Messianic Judaism. But while some Messianic Jews feel it’s important to separate Gentiles from Jewish praxis, they still can’t insist we distance ourselves from Hashem (and I’m not suggesting they are). On the other hand, Judaism in general believes that the goyim can have a place in the world to come under certain circumstances (although the Noahide Laws don’t quite map to the life of a “Judaically aware” non-Jewish disciple of Yeshua), so while a Jewish celebration such as Sukkot might not be appropriate for us (again, some of you will argue against this), entering the presence of Hashem through the merit of Rav Yeshua is allowed for us. So for me, at least for this year, the sukkah will have to exist in my imagination and in the future when we will all enter Hashem’s House of Prayer, which is a shelter for all people, Israel and the nations alike. Previous PostLoving Yourself: A High Holidays Primer for Non-JewsNext PostIf You’re Not A Jew, Who Are You? This is one of those times when I really wish your wife would write a blog essay, offering her own views on a situation that you’ve shared with your readers. For example, is it that she wishes simply not to burden you with another chore? Does she consider that it is too late, halakhically, to fulfill the mitzvah of rejoicing in her own Sukkah, having missed the initial Ushpizin (therefore relying on someone else’s Sukkah to fulfill it partially or symbolically)? Is she merely feeling a bit worn out from recent travels, that she can’t quite summon the energy to get into the Sukkot-holiday mood (and the additional efforts that go with it)? I’d hate to imagine any unkind motivation such as trying deliberately to exclude you from the holiday celebration because you are a goy. That would actually be contrary to the spirit of the holiday, anyway, because goyim were once, in fact, the focus of the water ceremony of Hoshanah Rabba, when not only the blessing of rain in the land of Israel and in the whole earth was in view but also the hope for redemption of the goyim (following the sacrifices of 70 bulls during the ‘hag, representing the hoped-for repentance of the nations of the ancient world). This is the connection that explains the requirement in the future period of Zech.14 for the nations to come up to Jerusalem to celebrate Sukkot or suffer drought. In light of this prophecy, representatives of many modern nations do similarly in Jerusalem nowadays as a symbol of their support for Israel and their godly intentions as goyim who have repented to the best of their ability. Consequently, I would not expect of her any motivation that inhibits her pursuit of greater Jewish awareness and fulfillment. But I *would* like to understand what *are* her motivations at the present time, given that they have affected you as described above. Regardless of the circumstances, ‘Hag Sukkot Samea’h! I don’t think her motivation is unkind, but Jewish observance and community is one area of her life she doesn’t want me too involved in because, after all, I’m a Christian. That said, I really thought she liked it that I built the sukkah each year, even if she didn’t use it. One reason I wanted her own expression and explanation is precisely this question of terminology. You and I both know that the term “Christian” has many meanings and shades of meaning; and that by its most accurate meanings you are actually not a Christian by its traditional definition as represented in historical behavior. You are something else that most folks, likely including your wife, are unable to acknowledge even exists: a non-Jew who devotes himself to the teachings of an ancient Israeli admor/rabbi, and who also studies other Jewish writers, without converting to Judaism. Thus you are mislabeled and misapprehended just as much as the real, historical, Rav Yeshua is obscured by a fictional religious gloss. Secondly, there is a difference between the observance of Jewish customs privately in your home and involvement in the wider Jewish community. She may feel embarrassment at the prospect of the latter, due to the aforementioned misunderstandings, but there must exist other motivations to inhibit the former (which would include much of Sukkot). The question is whether she can recognize and acknowledge this difference and these motivations; and express herself rather than sit by idly while you attempt to explain what you imagine is her view. I think she’s pulling the definition of “Christian” from the local Chabad Rabbi. Since she was formerly a believer in the local Messianic community, I think she’s reacting by compartmentalizing her past and her present as a Jewish person. I’ve found that in circumstances such as this, it’s better to just follow her lead rather than ask more questions about her decision. It is true that in a traditional sense, I would not be considered a normative Christian, but because of my father in Rav Yeshua, that’s enough of a put off for her. I admit that I was surprised that she didn’t want me to put up the sukkah, but for whatever reason, she doesn’t want me to so I’ll go with it. There’s so much about being a believer, at least for me, that’s put off until the future Messianic age. For the present, I’ll just have to wait. This month’s Messiah Journal by FFOZ spoke to this very thing – that Messianic Judaism for either a Jew or Gentile is not (traditional) Christianity, or at least that is my take on it. 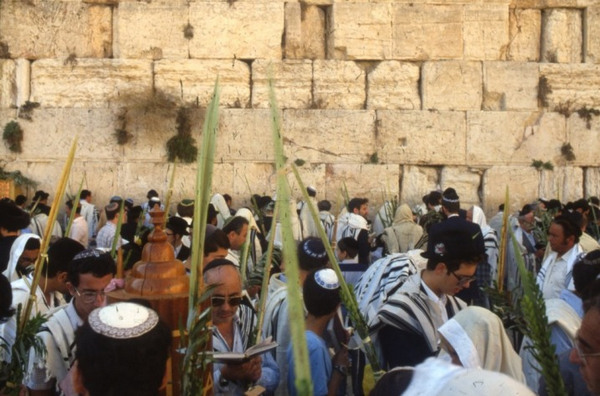 In more normative Judaism, anyone who worships Yeshua is considered a Christian. I’m not sure much distinction is made between denominations or sects of Yeshua-devotion, Ro. I agree, James, however I enjoyed a new perspective, a paradigm shift in thinking. Technically a Christian is a follower of Jesus of Nazareth as Messiah. Yet, I’ve started to have conversations with Orthodox Jews sharing a different perspective than traditional Christianity. They have been good conversations, neither trying to convert the other, just listening to perspective. FFOZ shifted my paradigm even more. Will also help as I have conversation with my Christian friends. But it was only an aside. Don’t want this to get off course of your blog topic, which I always enjoy. Reality seems to be bodily running over my desire to keep the chag, to keep even a normative shabbat. I know there are no requirements for me to keep the moedim, nor honor more than is specified via the noahide laws plus the Acts 15 additions to those laws, but I want to be celebrating YHVH, to be celebrating a life that fits with how Yeshua lived and will live again. I am tired of waiting for the people around me to understand, and help, not fight me every step of the way with their indifference. The details don’t matter, but the weight of indifference to Jewish festivals in a Messianic way seems almost heavier that outright opposition to it is. For some of us given our life circumstances, observance can be a very private thing. Ah, yes — more unexamined traditional terminology. The phrase “worships Yeshua” is perhaps made even more confusing by substituting the Hebrew name Yeshua in place of the “Jesus” that is actually in view in a phrase of that sort as viewed by what you invoked as “normative Judaism”. Again we are made prisoners of traditional Christian definitions of “worship”, as absorbed by Jews in order to maintain a defense of Judaism against those who would dilute it or invalidate it. Not only is there a need still to rescue and repatriate the messiah from leprous imprisonment at the gates of Rome, as depicted in the relevant midrash, but there is need to demand radical re-examination of a word like “worship” to eliminate idolatrous implications and emphasize rather its element of “honor”. Of course, even Chabad is split over the question of honoring Rabbi Schneerson as a messiah, accusing those who view him thus as too much like the ancient Christians who mistakenly deified one other rabbi. Until Jewish messianists who are Rav Yeshua’s ‘Hasidim can demonstrate a viable community of Jews who can maintain a continuity of Jewish learning and praxis that is not contaminated with Christian doctrinal views, it is unlikely that anyone within “normative Judaism” will relax sufficiently not to become defensive against his non-Jewish devotees (it’s a “kal v’homer” argument). Interestingly, such Torah learning and praxis was precisely what Rav Yeshua cited as a requirement for greatness in the kingdom of heaven (cif: Mt.5:19). Note, though, the practical implication that such behavior is a *communal* requirement and not merely an *individual* one. May we see such devotion soon and fully realized in our own days. Until Jewish messianists who are Rav Yeshua’s ‘Hasidim can demonstrate a viable community of Jews who can maintain a continuity of Jewish learning and praxis that is not contaminated with Christian doctrinal views, it is unlikely that anyone within “normative Judaism” will relax sufficiently not to become defensive against his non-Jewish devotees (it’s a “kal v’homer” argument). Interesting thought. So it seems you’re saying that before “Judaically-aware” non-Jewish disciples of Rav Yeshua can be seen as other than “Christians” by “normative Judaism,” the Jewish Hasidim of our Rav must create and sustain a viable Jewish community and be recognized as such by other streams of Judaism. Who can do this except Messiah? I didn’t say this would be easy … just ask your wife. I’m just sayin’ that a good deal of convincing may be required to overcome effects of the many centuries during which present attitudes were formed. In a recent conversation, I was reminded of the young Judean king Josiah (Yoshiahu) who ruled Judea about 2600 years ago and initiated many reforms to restore the observance of Torah after the book of Deuteronomy was discovered somewhere hidden in the Temple (some think it was the original manuscript recorded by Moshe and Joshua). Apparently a lot of Torah-prescribed behavior had lapsed into widespread disuse until Yoshiahu was inspired to encourage it. The rhetorical question looming over this conversation was about where we might find a modern-day Josiah who would restore Jewish messianists to enthusiastic Torah observance. I can only hope that this can be done by some authoritative enthusiastic Jewish messianist in our own era, without having to rely on the full power of the returning messiah to accomplish it. After all, it was ordinary adolescent and young-adult Jewish youth who sparked the modern MJ movement four decades ago. Should we need the messiah himself to do everything? Surely we can work on his behalf according to his principles, while we await his return eagerly. Indeed, this is the essence of the Hasidic notion of “bringing the messiah”. Hello to you all. Just feeling under the weather. But I am at least feeling better now. Since coming onto this site, I have had to realign in a lot of ways. I can see another interesting blog, with equally interesting comments. It reminded me of the clash Stuart Dauermann talked about in in his latest podcast “Jews, God’s Judgment and Our Attitudes” in “Towards a more Jewish Jesus” where he was asked a yes/no question by a Israeli Yeshua believer as to whether or not he considered believers in what I believe to be normative Jewish believers as being on a road to hell w/out confessing Yeshua as Messiah. James, I know I wasn’t there and don’t know your wife at all. But I don’t take her words to mean she didn’t want you to put up the sukkah (or was against you putting it up or wouldn’t have liked it being up). She didn’t want to tell you to put up the sukkah, especially late. But since there is no perfect way for you to observe Sukkot, and you aren’t even required to, as a goy you know, what if you just feel like putting it up now? Since you have concern not to offend her, maybe ask if it would bother her but that you want to do it. Or don’t even ask her, just get it out. If you never eat in it anyway, what does it matter if it’s up but wasn’t before. You’re just being your interested self and would miss it. And whether she’s asking you to or confirming or not, she is a Jew in your home. Where PL says, “Surely we can work on his behalf according to his principles, while we await his return eagerly. Indeed, this is the essence of the Hasidic notion of ‘bringing the messiah’”, I am reminded what Kefa said, “…what kind of people should you be? You should lead holy and godly lives, as you wait for the Day of God and work to hasten its coming.” (2 Kefa 3:11-12) Is it possible to bring Messiah earlier, than later, by continuing to keep His mitzvot, despite the world around us? Thanks for the reminder, Marko, that Kefa offered essentially the same suggestion. It does suggest that the answer to your question should be expected to be affirmative. We may not be able to obtain any certain answer unless we try; and somehow I can’t imagine that there could be anything but benefit to all if we do try. We only know for certain that it won’t work at all if we don’t try. Of course, what I said to you, James, is based on what you shared was said. If it was said slightly differently… or more was said, I wouldn’t know. The only other way I can “read” the words posted is that she surmised the matter wasn’t as important to you, after all, as she had previously thought. I know this is the last night of sukkot and a bunch of so-called Messianic Gentiles think we own this but it’s time to relax, back off and let Hashem handle this. When we’re finally invited in, He’ll let us know. I think a lot of people got left out of Sukkot again this year (I wish this could have been the year that it changed).. To me it isn’t a Biblical feast unless the poor, widows, orphans, sojourners, and other people that are supposed to be included are. I do think I received a blessing to be able to work with some Jewish and Non-Jewish coworkers during some of the feast days. I commemorated the first and last day on my own but it sure was helpful to have them there with me those other days, even if some of them haven’t even learned about the Biblical feasts. This comment is to James only, so I don’t want to hear any comments to hurt my feelings from anybody else. If you want to throw word bullets just remember I have a group of people I’m walking with who I think are going through the same kind of thing I am, that have been tossed to the side kind of like I have probably. I have been through about 12 years of not being invited to any Sukkot gatherings I could get to, which I should probably be rejoicing about if it isn’t being celebrated right anywhere near me anyway. I don’t know if my picture is right for what I hope to find one day, but I picture people making food to serve people that need it and the ones that don’t need it as much sitting beside them sharing it with them and actually striking up a conversation with them instead of just putting a plate a food in front of them to eat and leaving them by themselves. So, just know you are invited James. God through his word has already invited you. More people (or hopefully the ones leading the Sukkot gatherings) will have their eyes opened at some point I hope because the Bible is clear about who is invited. If you are not feeling welcome, just know the most important one that could invite you already has. Shalom alaiyich, Jill H — You didn’t make it quite clear whether you are Jewish, so I can’t really evaluate your sense of feeling that you or some others have been “left out of Sukkot”. However, it might be worthwhile to clarify that the inclusion of “the poor, widows, orphans, sojourners, and other people” is not what defines a “Biblical feast”. I don’t mean to imply that they should be dis-included or ignored, because care for such people is a perennial biblical concern — during a festival or at any other time. Nonetheless, each of the biblical festivals has its own purposes and requirements that are specific to the community of Jews, regardless of their socio-economic category. For Sukkot, for example, Jews are enjoined by the Torah to gather together the four species of the lulav, to rejoice for seven days, and to dwell in sukkot for that period to recall the period of life in the desert after leaving Egypt. No one else is required to do that — not even the non-Jews who cling to HaShem and honor His covenant with the Jewish people; nor even the non-Jews who will be required in the future messianic kingdom to ascend to Jerusalem each year for the Sukkot celebration. The prophecy does not state any requirements for them to live in sukkot, nor even to rejoice — though one might certainly expect them to be pleased about the promise of rain upon their lands (both physically and metaphorically); and one might similarly expect them to be grateful for the sacrifices that will have been offered on behalf of their repentance. Consequently, none of them, nor their present-day counterparts, should allow themselves to feel disenfranchised or “left out” if they should fail to be invited to participate in Jewish Sukkot observances. I was invited to some Sukkot gatherings very far away but it sounded like they were going to cost a lot (one at around $1,000). Very ironic to me how I feel shunned from the close gatherings and have an open invitation to the very far ones. You may not feel it right not but I see it as a blessing that you have family to commemorate even some of the Biblical feasts with. I have no physical or congregation family to celebrate them with so at least you are not where I am at. I did receive the blessing of walking with some of my Jewish and Non-Jewish coworkers during some of the days of Sukkot though (which I mentioned above), which might be something God added to help my situation. The third possibility is that your Jewish wife really didn’t want a sukkah at her house, as you’ve implied — and gone further to make it about you (and so many other people) not being invited in. A couple days ago, someone asked me if I wanted the kitchen lights off. I said I didn’t care. The person pressed on for an answer. I said he could turn the switch to off or leave it on. He kept on with the questions. Whichever was going to be the end result, he wanted praise for doing it (including for interrupting the electrical connection, his habit after he switches up, uses the kitchen, and leaves the room). The difference is I really didn’t care about the lights in the kitchen at that point in time. I wasn’t in it (he has actually turned the lights off while I’m in it — and, no, this isn’t a child). Or, due to timing, maybe it wasn’t so different except he won’t make himself a point of symbology over it. For the next three-and-a-half minutes, White, 50, explains why viewers need to contribute “sacrificially” to her Orlando-based organization – $10,000, or just a thousand – on this special day. She quotes verses from Leviticus and Deuteronomy, and notes that she, too, is fasting on this day. However, the times of the Temple, when animals were sacrificed and the high priest emerged from the tabernacle’s holy of holies, are long gone. Then comes White’s trademark prosperity gospel pitch.